The depth distribution of 137Cs in sediment cores provides information on the timing of sediment deposition. The sources of 137Cs to the Hudson River Basin include fallout from atmospheric testing of nuclear weapons, liquid releases from Indian Point Nuclear Power Generating Facility (IPNPGF) on the lower Hudson River, andliquid releases from Knolls Atomic Power Laboratory (KAPL) on the Mohawk River. For dating purpose, the utility of137Cs comes from the fact that it is relatively easy to measure and that all of these sources have been monitored over the last several decades. The annual delivery rates for these sources are reported in Chillrud (19 96). 137Cs, derived from atmospheric weapons testing, first entered drainage basins on a global scale in significant amounts in the early 1950s. In cores with semicontinuous and relatively rapid sediment accumulation (on the order of 0.5 cm yr-1 or greater), maximum activities of fallout 137Cs can be associated with maximum fallout delivery (Olsen et al., 1981; Ritchie and McHenry, 1990; Fig. 26.2). The largest recorded annual liquid release from KAPL occurred in 1963 while the largest annual liquid release from IPNPGF was in 1971. In a very small number of cores from the lower Hudson estuary that showed rapid particle accumulationrates, two peaks in a Cs-137 depth profile were observed. The first can be associated with the 1971 release from IPNPGF and the deeper peak with the mid-1960s global fallout maximum (Bopp and Simpson, 1989; Fig. 26.2B). Figure 26.1. Sampling sites in the Hudson River Basin. 1) Main stem, Upper Hudson River upstream of the Thompson Island Dam; 2) Batten Kill; 3) main stem, Upper Hudson River upstream of lock 2; 4) main stem, Hudson River downstream of the Federal Dam at Troy, NY; 5) Mohawk River; 6) main stem, Hudson River near Kingston, NY; 7) main stem, Hudson River, NY/NJ Harbor; 8) Newtown Creek; 9) Jamaica Bay; 10) Arthur Kill; 11) Kill Van Kull; 12) NewarkBay; 13) Hackensack River; 14) Passaic River upstream of the Dundee Dam. Figure26.2. The distribution of 137Cs activity with depth in fourHudsonBasin sediment cores. Core A was collected from the Batten Kill (site 2; Fig. 26.1). Also shown is the history of Zn contamination at this site. Core B was collected by NYSDEC personnel from the main stem Hudson at mile point 21.6 (21.6 statute miles upstream of the southern tip of Manhattan). The Cs-137 profile appears to reflect the influence of both global fallout (1963 peak) and inputs from the IPNPGF (1971 peak) at mile point 43. Figures C andD are depth profiles from two cores at site 1 (Fig. 26.1) collected eight years apart. In addition to providing contaminant chronologies, paired samples from these cores were used to study in situ reductive dechlorination of PCBs (McNulty, 1997). is approaching the decay rate ofCs-137 (t1/2 = 30 y) (Chillrud, 1996). Confirmation that the uppermost section of a core contains recently accumulated sediment comes from analysis of 7Be, a cosmic-ray produced radionuclide with a half-life of 53 days. Depth sections with measurable activity of 7Be have a significant component of particles deposited within about a year prior to sampling. At sites with very rapid sediment accumulation rates (on the order of several cm yr-1), depth profiles of 7Be can be used to estimate sedimentation rates (Bopp and Simpson, 1989; Feng et al., 1998). 7Be analysis has been useful at several sites in the New York/New Jersey Harbor where extremely rapid deposition (sometimes exceeding 10 cmyr-1) and disturbances of the sediment column caused by human activities such as dredging are commonly encountered. These factors make collection of cores with continuous decades-long records of sediment accumulation most difficult. Under such circumstances, surface sediments from areas of rapid deposition, if they contain detectable 7Be, define a time horizon within about a year prior to sample collection (Bopp and Walsh, 1994; Chillrud, 1996). Dating information can also be obtained from depth profiles of the natural radionuclides 210Pb and 234Th. 210Pb (t1/2 = 22 y) provides information on a time-scale of decades; 234Th (t1/2 = 24 days) on a time-scale of weeks (see Chapter 6, Cochran et al., this volume). 210Pb dating has been used extensively in lakes where low net accumulation rates (on the order of 0.1 cm yr-1) result in high specific activities on recently deposited particles (Alderton, 1985). In de-positional areas of the Hudson, however, the surface sediment activity of excess 210Pb is relatively low. While this limits the utility of 210 Pb as a primary dating tool, depth profiles have been used to confirm 137Cs based dating assignments in Hudson River sediment cores (Bush et al., 1987; Robideau, 1997; Benoit et al., 1999). A combination of 210Pb and137 Cs data was used to date a core from Central Park Lake, Manhattan and chronologies of atmospheric fluxes of lead and several other trace metals to the New York/New Jersey Harbor area were developed. The historical use of municipal solid waste incinerators was found to be a dominant source (Chillrud et al., 1999). 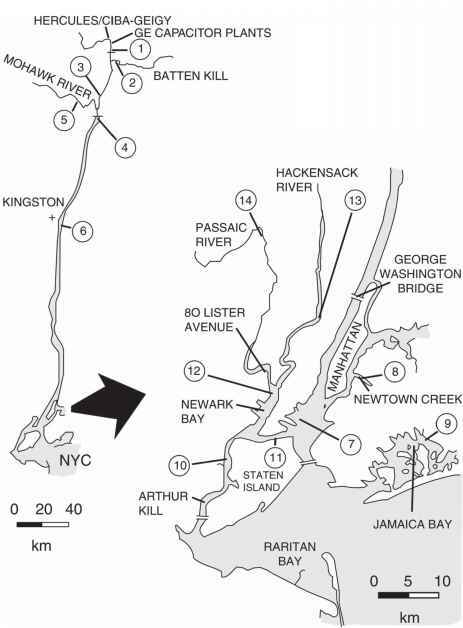 234Th has been used to study particle reworking in sediments of the New York Bight (Cochran and Aller, 1979) and for dating surface sediments of the Hudson Estuary (Feng et al., 1998). The temporal constraints on deposition are similar to those obtained from 7Be analyses. It has been suggested that for Hudson Estuary sediments, 234Th analysis does not provide sufficient additional dating information to warrant the higher level of effort involved in its analysis (Feng et al., 1998). In the Upper Hudson River (upstream of the Federal Dam at Troy, NY; Fig. 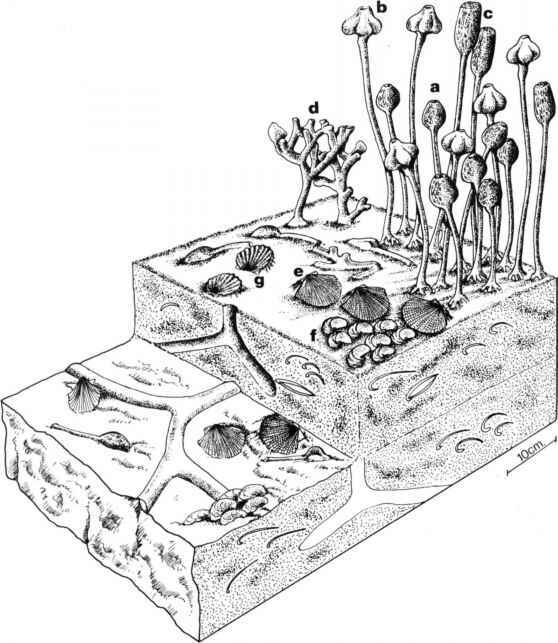 26.1), stable lead isotopes provide additional stratigraphic control (Chillrud et al., 2003; Chillrud et al., 2004). The Upper Hudson River is heavily contaminated with several metals, including lead, that appear to be derived from discharges from a pigment manufacturing facility in Glens Falls, New York. The total range in lead isotope ratios observed in Upper Hudson sediments through the last several decades is large, for example, for 206Pb/207Pb from 1.1364 to 1.2496, on the order of 10 percent. This large range provides an extremely sensitive tracer since mass spectrometers can measure this ratio to a precision of better than 0.05 percent. For purposes of stratigraphy, the key observation is that there have been four large shifts in isotope composition (each one being about half of the total range) occurring in the 1950s, 1960s, 1970s, and 1980s. 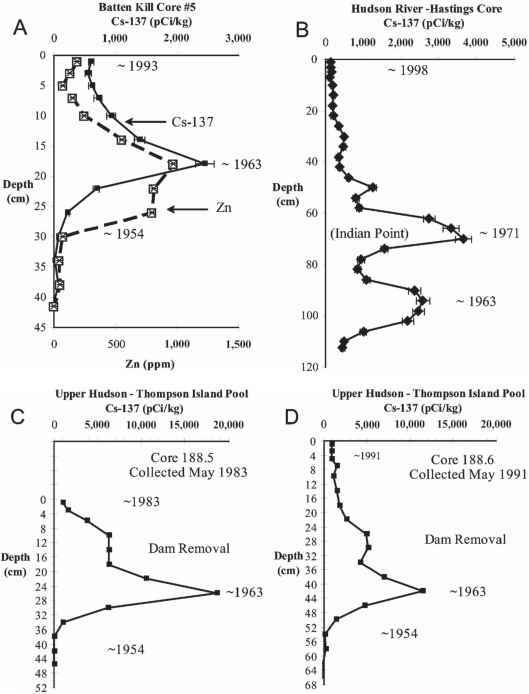 The temporal trend in 206Pb/207Pb is essentially identical in sediment cores collected from over a twenty-mile stretch of the upper river, and even 100 miles downstream the lead isotope composition at critical time periods is consistent with a predominant lead source derived from the Upper Hudson (Chillrud et al., 2004).